Inspired by public service media like National Public Radio, Futures Public Radio (FPR) is a student-led, community journalism platform at the International School of Beijing. Starting with case studies of two EAL and Learning Support students, workshop participants will actively engage with tools and resources in order to experience and develop a rich school community radio program, immediately applicable at classroom, divisional, or whole school levels. Educators will link the FPR program to disciplinary standards, EAL rubrics, and media literacy skills while celebrating storytelling, community, and citizenship. Judy, a recent EAL intermediate-level arrival, found her voice by embracing her role as the humanities class, town hall facilitator for the campus radio station and later became president of the HS Chapter of Futures Public Radio. She has since interviewed Brooklyn musicians Overcoats and continues to work on campus stories centered on issues such as transitions from MS to HS, as well as stories on the wellness components of the school cafeteria. Students often lack access to school administrators, especially those students from an EAL background. Judy's positive energy, engagement, leadership and language development is clear during a recent FPR workshop. Evan was a student with identified challenges with oral and written expression. He would often times spend a considerable amount of time searching for words which left him unable to respond to questions or to participate in class discussions. Although he was a great kid, his academic self concept was low because he was quiet and afraid to speak out in front of others. Evan’s experience with FPR helped to strengthen his processing, develop his word finding skills, developing his spoken confidence, improved his turn around and response time and allowed to shift from being a behind the scenes leader to speaker and leader in Futures Public Radio. These skills transferred over into his academic content classes, and even MAP scores, and now he is a confident, integral member of our classes both academically and socially. Evan has become a tech leader in the program, learning the intricacies of the FPR tricaster and leading tech support for the FPR live broadcasting booth in the cafeteria. Evan has become one of the station managers of the daily live broadcasting booth in the ISB cafeteria. Within 24-hours of finding out Luka Lesson was coming to visit FPR, Evan set up the cameras, researched a few of Luka's poems, and met the interview team at lunch to prepare the direction of the interview. The FPR Story Planner provides all students, especially diverse learners, with a foundation for expressing intentionality in choices ranging from set design to certain interview questions. Led by the question, "What does our headmaster do on a normal workday?" two of our UES journalists were embedded for four hours with Mr. Hurworth in search of an answer. When Space X engineer, Phillipe Kassouf visited ISB, the Grade 8 EAL class jumped at the opportunity to interview him. Below, the MS Student Council Smile Week event prompted an FPR team to visit the orphanage and tell the story behind the amazing people involved with helping the babies. What's the story you want to tell? FPR can be an authentic publishing tool, embedded into daily plans, units, or even as grade level capstone opportunities. FPR provides an awesome opportunity to stretch language objectives in all subject areas across reading, writing, speaking, and listening. Partnering with the Center for Applied Linguistics brings FPR an opportunity to share EAL Empowerment with a greater community. 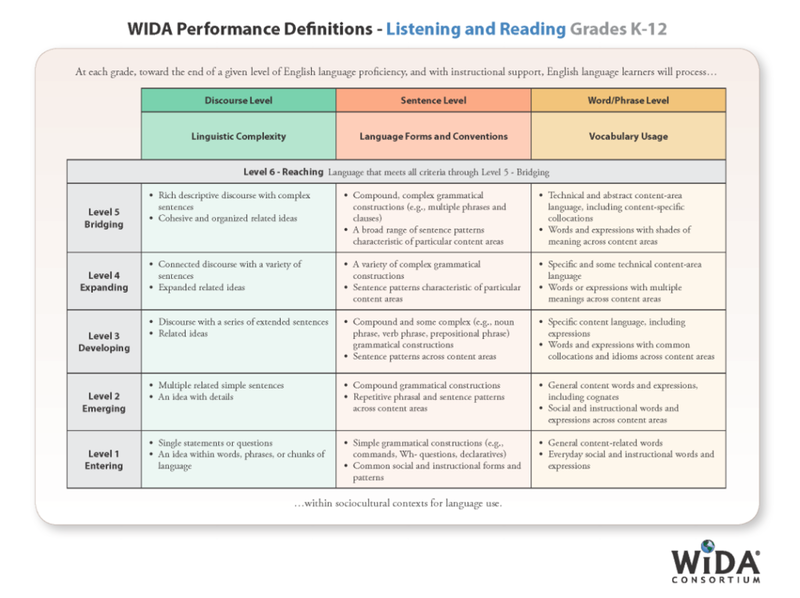 New WIDA Interpretive Rubrics provide a foundation of easily assessable opportunities, both formatively and summatively.